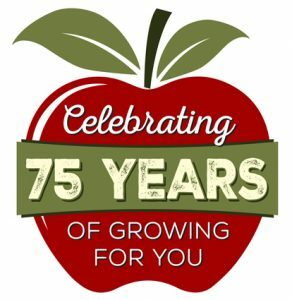 Mercier Orchards, a family owned and operated apple orchard now in its 4th generation with some 300 acres and over 100,000 fruit trees is proudly celebrating its 75th Anniversary this year. Mercier’s has a proud past and a very promising future. Started back in 1943 by Bill & Adele, Mercier’s is truly a family affair. Tim Mercier, the current President and CEO of the company, attributes the success and longevity of the business to the hard work and creative ideas of his parents’ advice and experiences. The founder, Adele Mercier, made her first Fried Apple Pie in an Iron Skillet in 1965 in the small four-wall apple house on the hill that is used for weddings and special events today. Her same recipe and crust is still used in the World Famous Fried Pies selling over 1.3 million last year. Mercier’s has a Bakery, Café which offers a delectable breakfast and lunch, Candy Kitchen, large market store, and a winery. Mercier’s has been making cider for over 40 years and is the only orchard in the state that grows, presses, ferments and bottles it’s cider including hard cider..
Mercier Orchards offers its visitors a fun filled experience for the whole family! From seasonal U-PICKS of strawberries, blueberries, blackberries, peaches and apples, to informational tractor rides complete with a guide on board to share its’ rich history.